Sort of near Hackney and Bow, London. Yet again, it's one of those "former motorways". Nowadays it's part of the A12. What's it all about then, a tiny motorway near the centre of London? Well, as you might expect where London's concerned, it's a matter of Ringways and Motorway Boxes. This little stretch of motorway was the north-eastern corner of Ringway 1, the innermost planned motorway ring road for London. If you go and take a look at the northern junction at Hackney Wick, it's a complete mess. Why is it such a mess? Simple, really - there are two missing motorways! 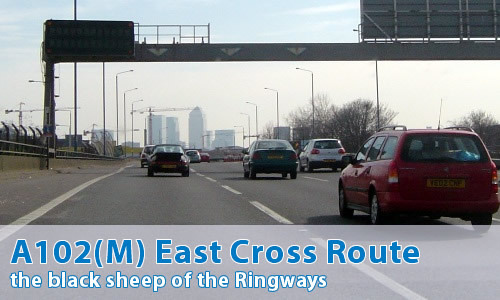 One is the North Cross Route, which would have headed, unsurprisingly, across the north of the centre of London, through Hackney and Camden Town, to meet the West Cross Route, or as we know it, the M41 somewhere near Wormwood Scrubs. But that's over 4 miles (7 km) away! If you have a look at a map with a ruler, you can see how the southern end of the M11 aims straight for Hackney Wick. There's also a few missing numbers in the M11 numbering scheme, just in case you needed more persuasion. "This road is actually a lot safer than it was when it was a motorway; there used to be a set of traffic lights at the Hackney Wick end, which you would happen upon at the last minute on rounding a tight corner. Well dodgy!"